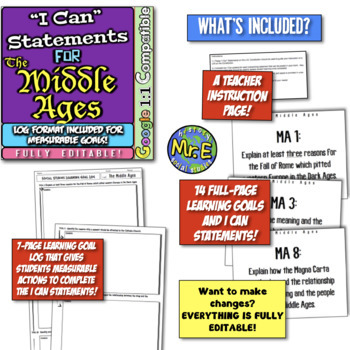 In this highly-effective purchase, you receive two major pieces to supplement any unit on the Middle Ages and is a great supplement to the 14 lesson Middle Ages Unit located here! 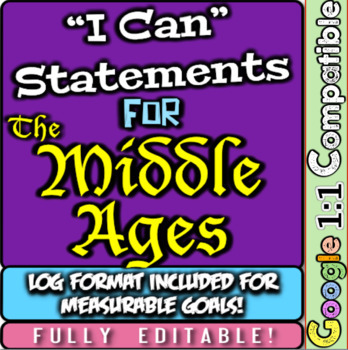 First, you receive 14 full "I Can" statements and Learning Goal posters for the Middle Ages, the Fall of Rome, Charlemagne, the Catholic Church, Primogeniture, the Crusades, the Bubonic Plague (the Black Death), and more! 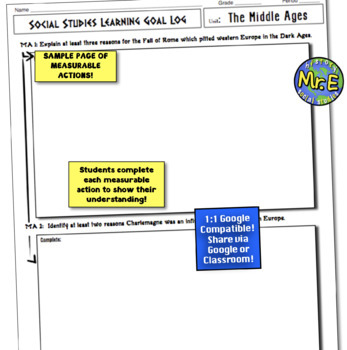 Second, the 14 statements have been arranged into a 7-page student log format where students complete measurable actions to show their understanding. For example, the first I Can statement has students, "Explain at least three reasons for the Fall of Rome which pitted western Europe in the Dark Ages." A Google 1:1 compatible version is included! 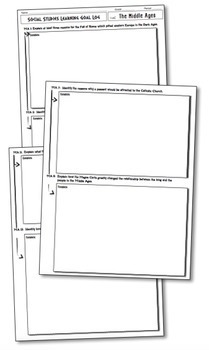 Also, the paper version is entirely editable!